Marriage is misunderstood, undervalued and under attack in our culture. To see a godly marriage these days is refreshing and a glimpse of the beautiful work that God made it to be. "Your Marriage Masterpiece" by Al Janssen is a fresh look at God's design for marriage and His purpose behind this lifelong union between a man and woman. Through real-life stories and biblical narratives, Janssen shows us what the Great Artist had in mind when He created the complex and beautiful marriage relationship. I appreciate the vision for biblical marriage that Janssen shares in this book to restore marriage to its former glory. Personally, the writing style didn't draw me in and I wasn't blown away by the book itself. Personal preferences aside, I still give this book a positive review because it does offer insight into God's design for biblical marriage and that is something that needs to be shared much more often in this culture. Learn more about Your Marriage Masterpiece on Amazon.com. Visit Bethany House on Facebook, Twitter, and Instagram. I received this book from Bethany House in exchange for my honest review. I love running. Going out for a jog makes me smile. It's the strangest thing! I need to tend to a crying child, jump on a shower opportunity or some food smells really good. Then I forget the idea of stretching all together and my tight hips/hamstrings/calves make me pay the consequences later. Stretching is worth the extra time! And I'm learning to respect that. I recently stumbled upon Ekhart Yoga's YouTube videos and have enjoyed them because they are simple, easy to follow, and free (yes, that part is key!). Plus, the teachers are actually wearing modest clothing, which is important to me considering I usually have little men doing yoga with me. Stretching itself is important for running performance and general health. It makes me a better runner and taking care of the body through weight training, physical exercise and stretching will make the "aging process" more graceful as well. TUES: Yoga for Runners, 00:20. SAT: 4.06 mi double stroller run, 00:38 @ 09:15 pace. Ran with the littlest in the double while big brother was at home with Daddy. I appreciate that the stroller pushes well even while only half-full!. What is your favorite stretching routine? Do you do yoga regularly? Via video or an in-person class? 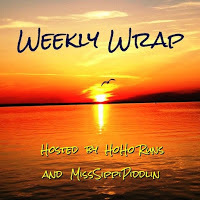 Linking up with Holly and Tricia's Weekly Wrap Up. Fall is crisp, cool and dare I say... calm? Harvest is coming to an end, the mosquitoes and wasps in our backyard are mostly dead (frozen, I hope), and pumpkin spice everything is in season. This really would be my favorite season if it wasn't so short-lived. Winter will likely arrive next month accompanied by ice, snow, and other cold weather hootenanny. With perfect timing Rhea Footwear contacted me with an opportunity to review one of their products with the patented NeverSlipTM outsole. The Daphne Brown Bootie was my shoe of choice because when I think Fall, I think boots! The Daphne Bootie is water-resistant and made with soft full-grain leather with ventilated leather lining. These boots are comfortable and stylish with a 1 3/4" heel and side zip closure. Aside from my running shoes (equipped with YakTrax to prevent ice slippage), I wear boots all winter long! I have had many "close calls" wearing my dress boots out in the ice and snow because their bottoms are smooth and have very poor traction. There will be no slipping this winter with Rhea’s patented NeverSlipTM outsole! The Daphne Booties work well with my Kara Jeans from prAna and I paired them with a navy dress and grey leggings for church on Sunday. Super simple, practical and comfortable! I'm a big fan of these Daphne Booties and I plan to wear them like crazy all year long! Find these boots and other great styles for men and women at Rheafootwear.com. What is your favorite Fall style? I received these shoes from Rhea Footwear in exchange for my honest review. I chose to review this specific Rhea Footwear product and all opinions are my own. At the end of September, I ran the Grand Forks Marathon, my goal race for the end of 2016. Then two weeks later I toed the line of the Blue Ox Marathon. Running marathons two weeks apart sounded crazy to me at first (I'm no ultra-runner). Borderline a bad decision. But I was too curious to pass it up. I asked around the dailymile running community and Google'd it (of course). Turns out, back to back marathons aren't a new concept and the trend seems to be growing in popularity. Some recommended using one race as a "training run" and one as a "race". Others found they were able to race both and ran even faster in the second. Okay, sounds good. I'm doing it! How could this sound like a "good" idea? Because marathon training, as fun as it is, is still the hard "work". It's the time commitment, early mornings, tired body and a whole lot of self-discipline. Race Day itself is much more exciting and the discomfort is very temporary. Especially in these childbearing years, fitting in more races during an "on" year is ideal. I squeezed in three full marathons this year because, Lord-willing, we want to grow our family again soon. That means three marathons this year and possibly no marathons 'til who knows when. I know I will be back, I'm just not in a hurry. This season is a short and precious one! 1. Foam-Roll, Easy Run, Rest, Repeat. One key principle that all of the back to back advice shared was RECOVERY. With only two weeks between the marathons, your body cannot gain any more fitness. I ran a few easy runs, super low mileage, stretched and foam rolled. I tried to stay off my feet more than usual, or at least I did my best with two toddlers. Immediately after running a marathon, I can't hardly eat anything. Only a day later and I will eat everything in sight! I did my best to eat quality foods — like healthy re-carb-loading for the next race — and I drank water like crazy to make up for all I lost in the first race. Lots of water! While I raced the first marathon all-out (because I didn't know there would be a second), I had a tentative plan for the second marathon: Run the first 13 miles at race pace and adjust from there. Would my legs stop working or would my energy tank? 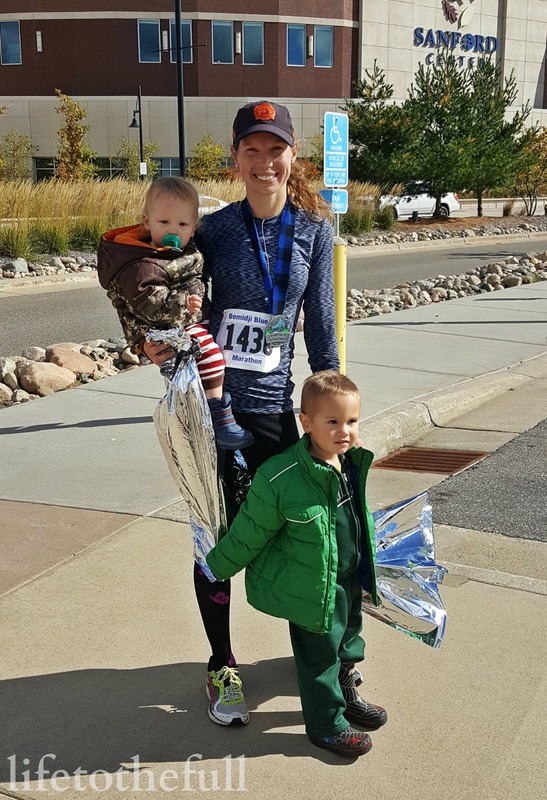 I wanted to stay open to the idea of slowing down and running a more leisurely pace for the last half of the race, if necessary. 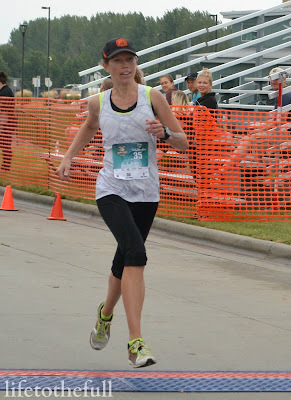 One of my worries about running another race was ending on a bad note. The Grand Forks Marathon went well and I didn't want to end the year with a DNF or a death march. I took into account the fact that I had just run a marathon but I didn't dwell on it. Keeping a positive attitude and remaining thankful for this opportunity was key. Each stride, each run, each race is a gift from God and I remind myself of that often. 5. Account for a Harder "Wall"
Mile 20 seems to be my "wall" in most marathons — So close, but yet SO FAR! I anticipated the second marathon's wall to be even worse than in my first marathon and ran the first 13 miles to compensate for that. The Blue Ox is a more challenging course with hills, especially from mile 20 on, and the extra time in the bank from the earlier miles helped to keep me on track for a good finish. Photo provided by the Blue Ox Marathon. So what happened? The back to back marathons went AWESOME! 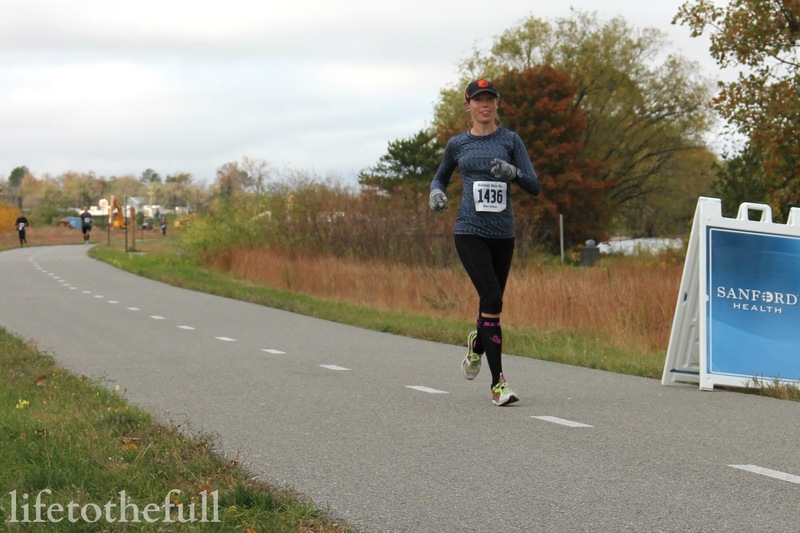 I was more fatigued in the second marathon, especially that final 20, but I was able to run faster because of the cool weather and possibly some training benefits from the earlier marathon. Whatever happened, it worked well! 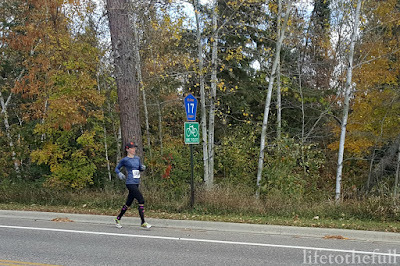 I recover from marathons relatively quickly and that made this experience a great one. In case you didn't catch my recaps of the Grand Forks Marathon and Blue Ox Marathon, I actually ran almost 3 minutes faster in the second race. TUES: 3.5 mi double stroller run. Watchless easy run with the kids while we hunted for pretty Fall leaves. THURS: 4.07 mi double stroller run, 00:38 @ 09:15 pace. A grocery run. Literally. FRI: Yoga for Runners, 20 minutes. I finally found free Yoga videos that I really enjoy! Ekhart Yoga has a great variety of videos to choose from. SUN: Yoga for Runners, 20 minutes, and neck/shoulder stretches, 5 minutes. Have you ran back to back races before? 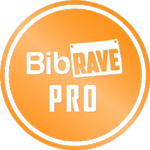 Ultrarunners, what is the most amount of miles you have ran in one race? 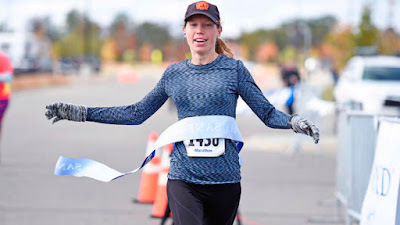 Michelle (aka NYC Running Mama) wrote "How to Run Back to Back Marathons" in 2012 and her post helped me immensely in preparing for this first back to back attempt. We have acquired quite a few temporary pets from the outdoors this year. Let's see... there was "Sweetheart" the Lady Bug, "Little Ant" the green worm, and definitely dearest to E's heart has been "Max" the Woolly Bear caterpillar. Grandma P brought this furry little caterpillar to E while we were visiting the farm and he turned into quite a science adventure! 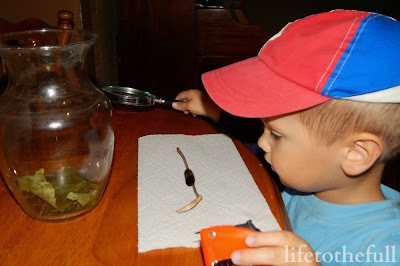 After identifying him as a Woolly Bear caterpillar, we looked into what Max would need to eat, what his life cycle is like and where he needs to live. 1. Legend has it that these color bands were a prediction of the coming winter weather. A thicker black band would mean severe weather while a thicker brown band meant mild weather. Thankfully this isn't a reliable weather prediction because, according to Max, we would have severe winter weather coming our way! 2. The Woolly Bear is the caterpillar form of the Tiger Moth. Their bodies are able to "freeze" over the winter and resume normal life in the Spring because of a cryoprotectant in its tissues. Isn't that crazy?! 3. Woolly Bear caterpillars eat many plant varieties. They do prefer bitter herbs such as milkweed. To water the caterpillar, we sprinkled a little rainwater in his "vase habitat". 4. We hope to catch another "Max" when Spring arrives. 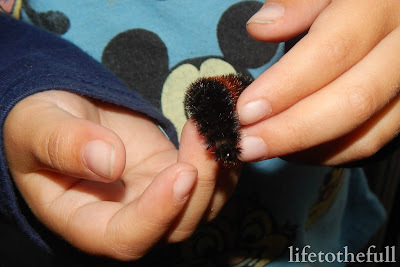 Because our winters are so long here, it's best to catch a Woolly Bear when the weather is warming up so he can be released into nice weather. Keeping him alive (and safe from toddlers) for 6 months is asking a lot! Both of the kids loved watching Max when he was active. These caterpillars do tend to sleep during the day and be active at night, but they were able to watch him climb around some. And E got to hold him before releasing him back into the "wild". We did release Max after a week and hope to revisit this in the Spring! Living in our area of the northern states, my concern was that our Woolly Bear would cocoon himself too early and emerge while it was still quite icy and cold here. While we can keep his caterpillar form indoors, we can't keep him indoors in moth form. 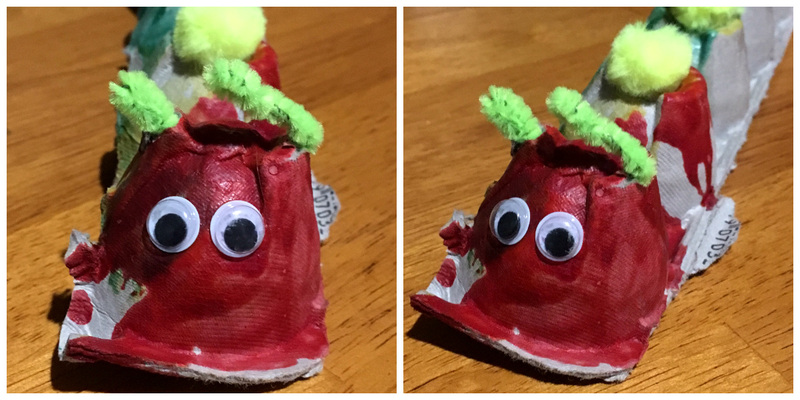 In honor of our Woolly Bear, E made his own caterpillar and I appreciate that this one doesn't require feeding or habitat cleaning. Clearly this guy was inspired by the "Hungry Caterpillar" book! Have you cared for a caterpillar from larva to adult? What has been your child's most interesting "pet"? 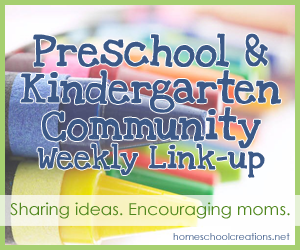 Joining in the Preschool & Kindergarten Community Weekly Link-Up and Mommy Moments. Hey there! 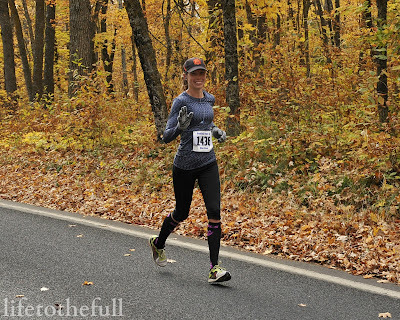 Well, I'm all in the marathon recovery mode over here and this is my "running recap" of absolutely no running. Everyone chooses to come back to running post-marathon when they're ready and I'm just not feeling it yet. The two marathons in 2 weeks experiences was AWESOME by the way and I will share more of my thoughts on that next week. Seriously, I hope to do it again in the future! MON: Active recovery. Walking with the kids, stretching when I felt like it. WED: Legs are feeling much better! More active recovery and stretching. In my past two marathons, I wore two different sock styles from SLS3: short neon sport sock for the first, compression socks two weeks later. My SLS3 Butterfly Compression Socks were just the trick to keep my legs warm on the cool October race day. Plus my legs always feel "faster" when I wear compression socks. Is it just me that feels that way?! You’ve spent your hard earned money on your exercise gear like triathlon shorts or compression socks and now it’s time to put it to the test. After a grueling workout, you and your Lycra® containing gear are ready for a bath. By the way, Spandex is the generic Lycra® version. Lycra® is a brand name trademarked by DuPont. As much as we hate it, we’re all drenched in sweat after a good workout, which means our clothes are, too. If you don’t have time to wash your clothes right after your workout, or you’re too tired like me, then hang dry your workout clothes, making sure there are no wrinkle or overlaps. This prevents your gear from turning into a mildew breeding ground. Gross! It also helps prevent weird stenches from staying trapped inside your clothes. The best method for remedying smelly gym clothes is to give them a prewash. Soak your Lycra® outfits in one part vinegar, and four parts water for at least 30 minutes before hand washing, or throwing them into the washing machine. Rinse your clothes thoroughly before washing them to get rid of any vinegar. DO NOT mix vinegar and bleach ever! If your detergent contains bleach rinse out your vinegar soaked clothes before throwing them in the washer. Do not use vinegar in the rinse cycle of your washer if your detergent contains bleach. DO NOT use heat for any of your Lycra® garments. Heat will destroy the elastic properties aka the Lycra® fibers of your outfits. Avoid the dryer, ironing and the sun. Remember: Heat is bad. DO NOT use chlorine or bleach. This will destroy the fibers of the fabric and you will get “bag and sag” syndrome. DO NOT use Fabric Softener. These are used to soften clothes and will make sure your expensive garment will never retain its shape. Avoid the fabric softener. Although it is said that hand washing is always the way to go, most of us don’t have time for that. Don’t fret though! It is safe for your Lycra® garments to go into the washing machine following these steps. First, make sure that all of your zippered garments are zipped all the way up to prevent the zipper track from snagging onto other fabric during the washing cycle. Turn your clothes inside out. Put delicate items into a mesh laundry bag, lingerie bag, or pillowcase to protect them (Definitely do this for Bib Shorts). If you are worried that a pre-soak just won’t cut it for getting all the smells out, you can put some vinegar in the fabric softener dispenser of your washer. This will make sure your washer will dispense vinegar in the rinse cycle. Always use cold water when washing your Lycra® garments. Heat will destroy them. Set your washer on the “Delicates” setting to prevent damage of your clothes. Use less detergent than you normally would for your Lycra® clothes. While detergent cleans your clothes, you definitely don’t want a build up of it on your workout clothes. A build up of detergent will trap in dead skin cells and trap bacteria into the fabric. If you want to make sure your clothes last, try a detergent designed for washing workout clothes. After the washing cycle has been finished, hang your clothes up, or lay them down flat to dry. Never put them in the dryer. Remember heat is not friendly to Lycra® clothes. Lycra® is a fast drying fiber so your clothes should not take too long to air dry. That's a wrap! Use the code "BLOG40" to receive 40% off your SLS3 purchases! Do you run in compression socks? What is your favorite piece of running attire? October 25th is an exciting day for football fans and football not-fans alike! Why? Because it's the big release date of Tim Tebow's book, SHAKEN! Because He is at my right hand, I will not be shaken. SHAKEN is an inspiring and relatable read because we have all been through the storms of life. Even before reading this book, I have been impressed by Tim standing true to his faith despite criticism and for blazing the trail for homeschooled students to participate in public school athletics. SHAKEN certainly doesn't disappoint. Tim's writing is authentic as he shares the struggles that have tried to "shake" him but his faith stood strong. His story is an inspiration as his identity has stood strong in Christ. Now mark your calendar for October 25th and stop by TimTebow.com/SHAKEN to pre-order your book! In the meantime, check out the book trailer for SHAKEN here and enter to win a Signed, Advanced Release Copy of SHAKEN here. You won't want to miss this book! I received this book from Blogging for Books for this review. All opinions are my own. This is my last race report for the year, I promise! The last two weeks have been my version of a "2-for-1" deal: two marathons for one training cycle. Saturday started with a 4:45 am wake-up. After breakfast and packing up, Grandma (my mom), the little ones, and I drove 2 hours to the Blue Ox Marathon. After running the Grand Forks Marathon two weeks ago, my mom said, "So what about running in Bemidji (Blue Ox)?" At first I laughed a little. I had never entertained the idea of running two marathons so close together. Meh, no thanks. Mom, you're crazy! A few days later, my legs were feeling much better and the idea sounded more appealing. I could always use another marathon under my belt. And if she's volunteering childcare, why not!? We arrived about an hour before the race and I hurried off with little W in tow to grab my number. Grandma and E made their way at a slow toddler pace because E was in awe of all the action. Number on, kids settled, and it was time to line up. Unlike the Grand Forks Marathon, there was no pacer for 3:25 but we managed to make our own "pace group". Honestly, I didn't know what pace my body could handle after only partially recovering from the last race. My flexible goal was to run around 7:45-8:00 for the first 13 miles and then either slow down to "enjoy" the race or keep on pace. I was with quite a few other runners but the group was starting to space out. I had been watching one of the marathon's biking guys for a while and realized he was leading the way for our female group. If I can keep up with that bike for 20 more miles, I can win this race! The prospect of being the first female finisher seemed real but we had a long way to go. Just 20 more miles... ha. Whatever the outcome, I prayed that God would help me to be content. Winning would be great but that's not why I run. Psalm 119:18 was the verse that kept my perspective in this race — to focus my eyes on what God is doing right now and not get stuck in my own little tunnel vision. I want to soak in all of God's work, what He has put on my heart, and where He has me at this very moment in my life. Open my eyes that I may see wonderful things in Your law. The field was spread out and I was very thankful to be running with my iPod. That was something new I did in the Grand Forks Marathon and this race and I really like it! Between chasing the lead bike and listening to music, I needed to keep my mind off the paincave that is the last 6.2 miles of the Blue Ox. This was my college town and I remember the Birchmont Drive hills well. My hope was that I ran fast enough earlier in the race to make up for hill troubles later in the race. By now, my legs were very much remembering that they had ran a marathon two weeks ago. On the last few hills, I power-walked a few strides to loosen up my muscles. Those muscles that were "aflame" during the Grand Forks Marathon were burning once again but the power-walk strides seemed to help. I really wanted to walk at mile 24. Like really, really bad. I kept a decent pace through the finish but I honestly didn't have any "kick" left in me. I was spent. 3:25:36. I beat my two-weeks-ago self on a harder course and that felt awesome. Crossing the line as first female and breaking the tape was icing on the cake! Here ends all of my racing endeavours for 2016. I am thankful to end the year on a good note and I do look forward to returning to the marathon again after a year or two break. I still need to break that 3:15 barrier someday. And, who knows, maybe 3:00 after that? A girl's gotta dream! Thank you all for your support and encouragement! Praise the Lord for the ridiculously awesome sport of marathon running and thank you to my mom (a.k.a. "Grandma") for basically running her own marathon while watching the kids that day! And, of course, thank you to my amazing husband who supports my love for running long distance, even if he doesn't understand it! Hi! My name is Amy and I am the writer behind "She Runs By Faith". I am a follower of the Lord Jesus Christ, wife to an amazing man and mom to THREE little men in the making. I have a passion for running, writing and dark roast coffee. She Runs By Faith Copyright © 2016-2019 Amy Will. All Rights Reserved.